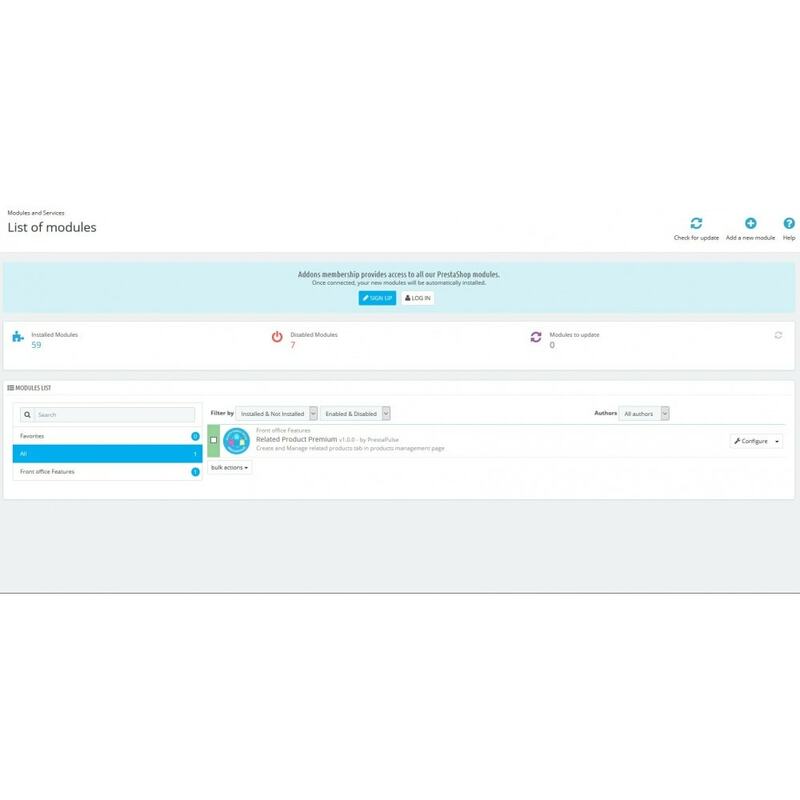 The Related Product Premium + BuyBox module lets you set up flexible and highly effective cross-selling by enabling you to offer your customers products linked to the one they are viewing. 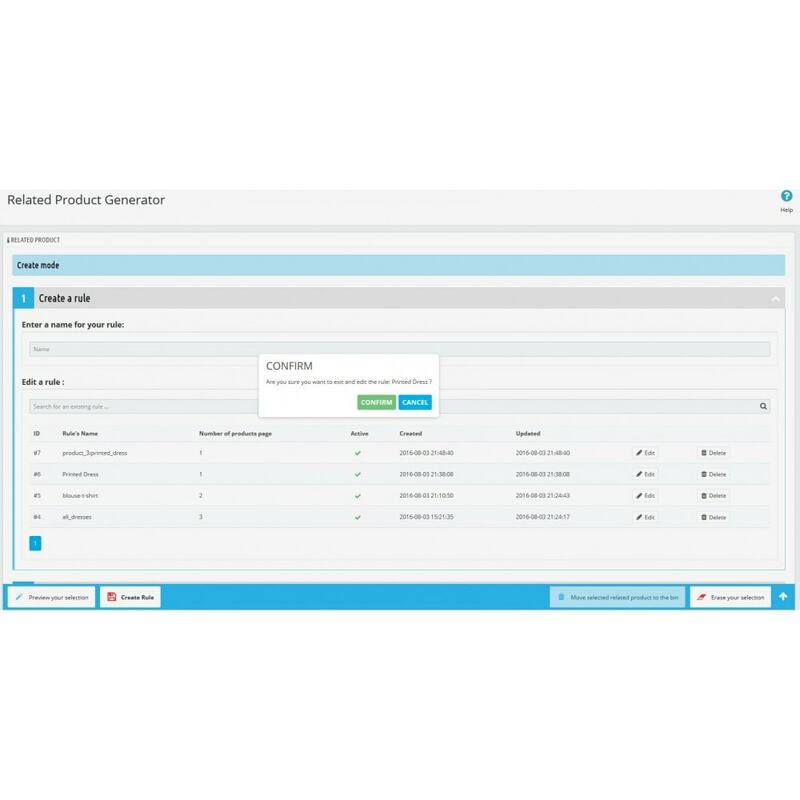 Advanced, flexible and fully-featured, the Related Product Premium module gives you the ability to precisely set up and define your linked products. It is a genuinely efficient tool that enables you to easily create links between your product pages. 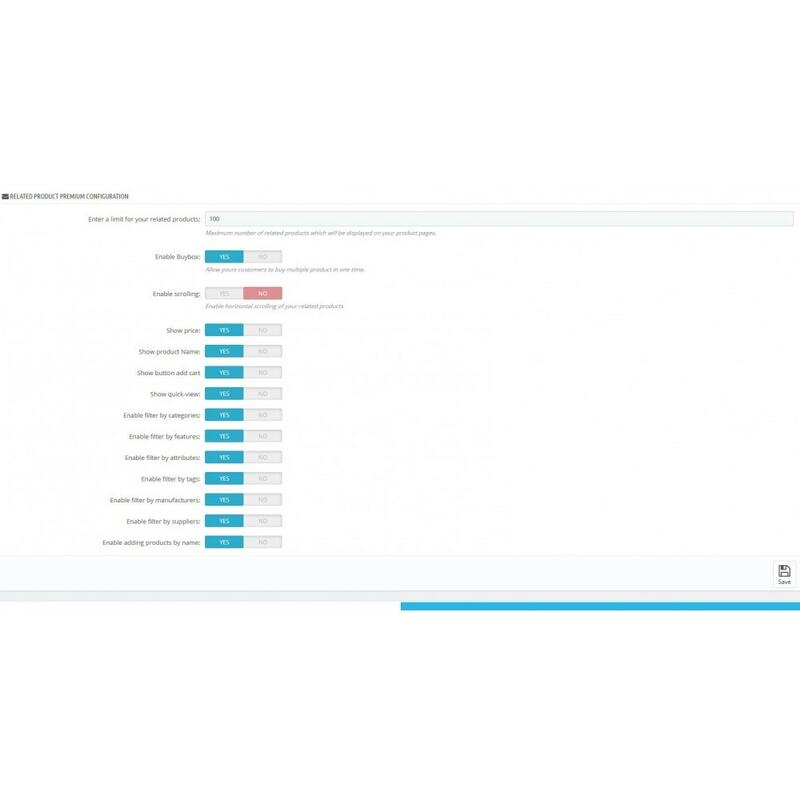 The detailed and clearly laid out admin section lets you define your linking criteria both individually (product by product) or by lots (several product at a time, via the rule generator). 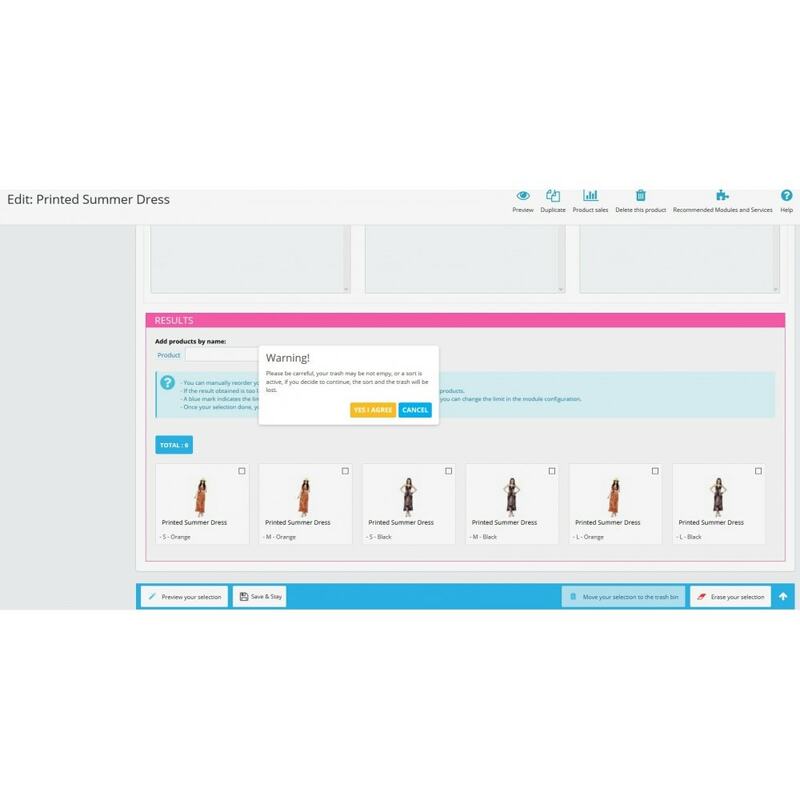 With the "BuyBox" display mode, your customers have the possibility of purchasing multiple linked products with just a few clicks. The BuyBox view, giving customers the option of purchasing linked products in lots with few clicks. 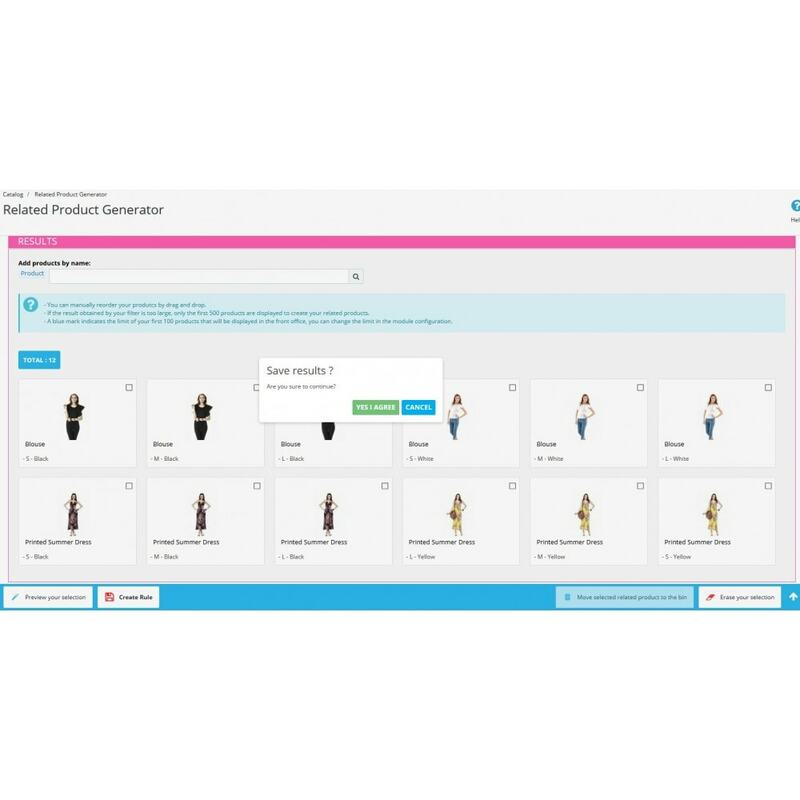 The ability to establish links between products by categories, features, attributes, manufacturer, supplier and tags (this list will be extended in the future) and offer customers items that are complementary to the one they are viewing. 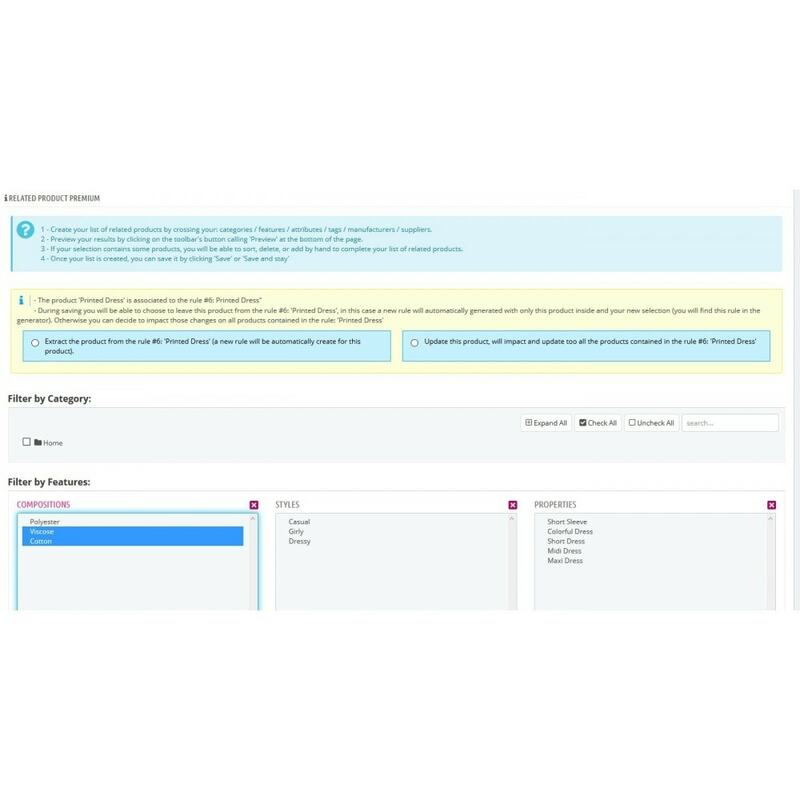 The ability to manage product version ranges in a new way, making it easier and simpler for your website visitors to purchase all versions of a single product. 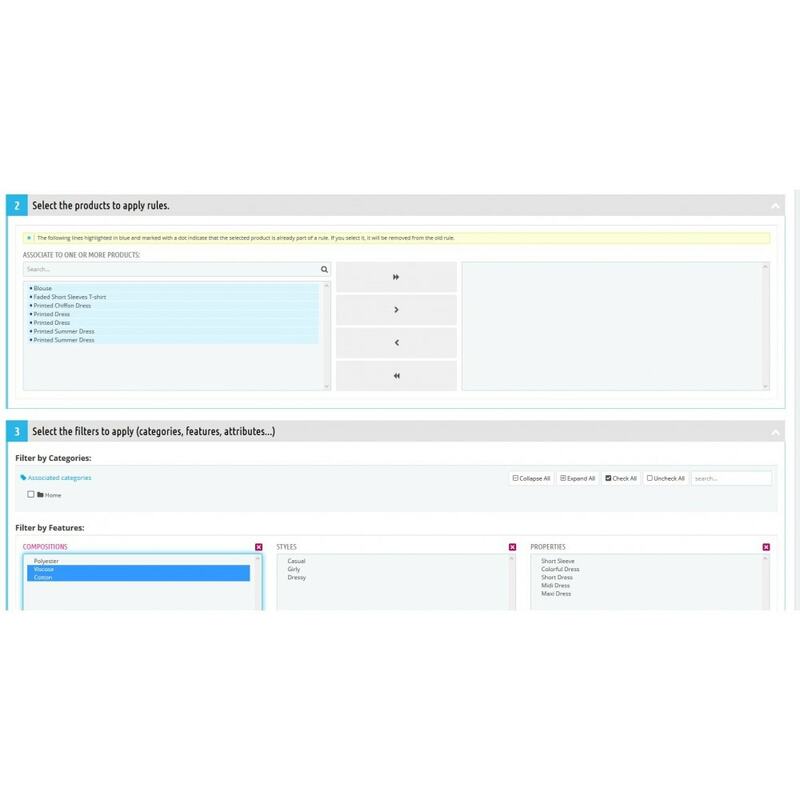 Three different front-office display modes for your web visitors: "BuyBox" (purchase of multiple items at the same time! ), "Slider" and "Mosaic". - Flexible and powerful configuration. 1/ For example, you would like to link 20 cm diameter wooden salad bowls of certain specific shapes and which are supplied exclusively with salad cutlery. 2/ As a second example, you would like to offer alternative matching salad cutlery in specific colours and materials and from certain brands only. 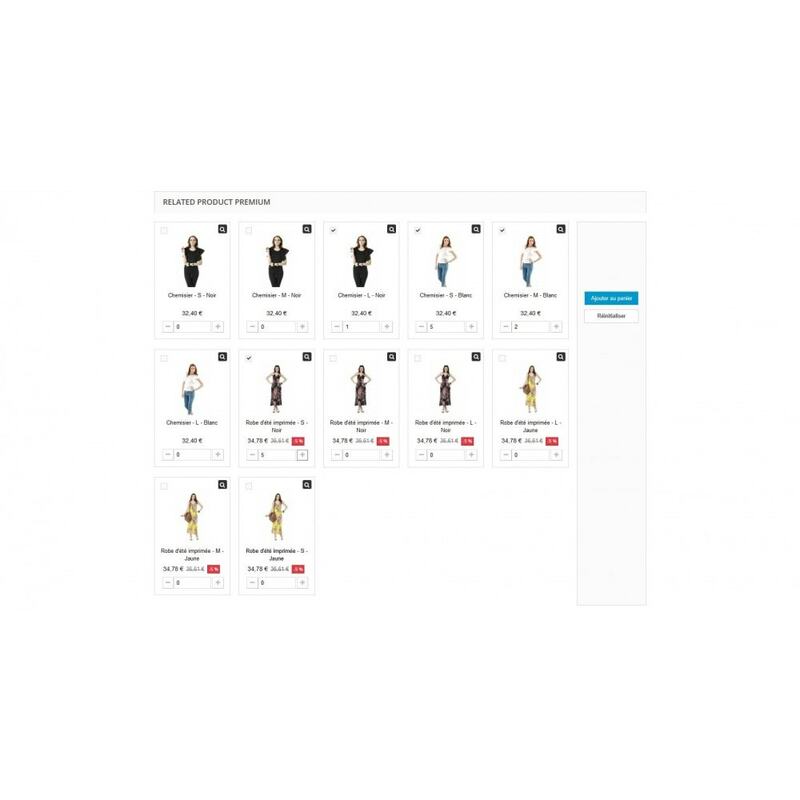 3/ As a third and final example, you would like to be able to sell all the different versions of a given product at the same time using a method that differs from the one normally offered by Prestashop. Let's say that in the case of our salad bowl, we want to display all the different versions of the product on a mini form so that they can be purchased as a single lot rather than via the classic view. 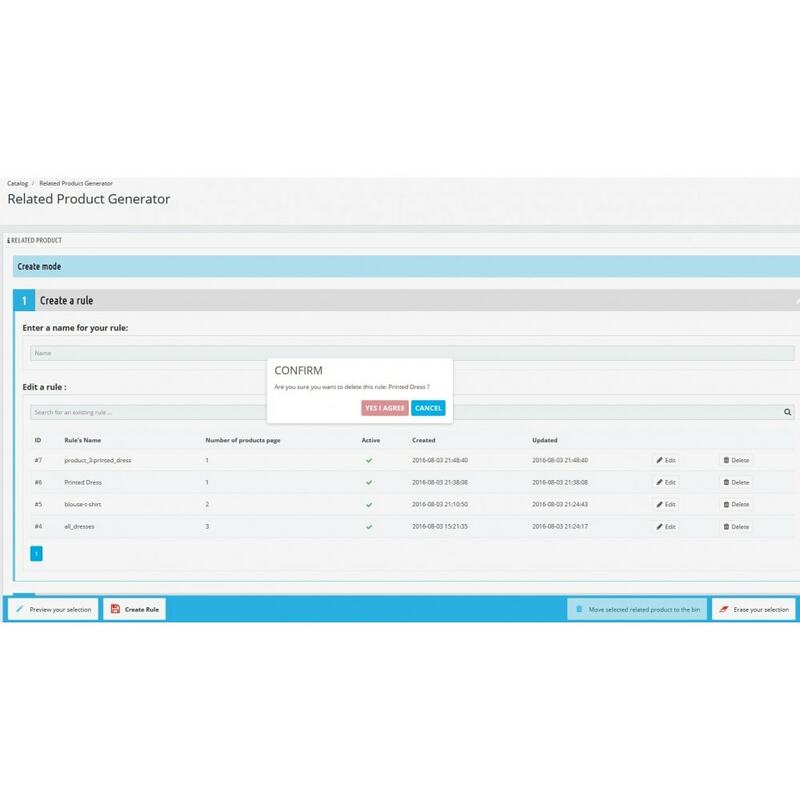 To achieve this, simply select all the different attributes covering all the various versions of your product in addition to the filters you have already applied … and that's it … job done!